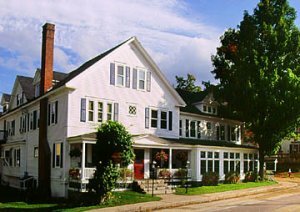 The Sudbury Inn is an 1873 bed and breakfast / country inn located in the heart of the beautiful mountain village of Bethel, Maine. Popular with generations of skiers, hikers, tourists, and other visitors for its accommodations and dining, the inn is the only B&B in town that offers lodging, fine dining, a French-style bistro, and a lively pub (Suds Pub), under one roof. The inn offers select and standard rooms, all with private baths. It welcomes families -- there are 7 two-bedroom suites and one three-bedroom apartment. It is also very pet friendly, enjoying furry guests and their owners in the Carriage House. The Sudbury Inn boasts excellent staff, many of whom are ''Mainers'' and long time residents of Bethel and its environs, and are experts on what to do and see in the area. LODGING AMENITIES (for amenity search on Where To Stay page): TYPE: Bed & Breakfast/Inn. BED: King, Queen and Twin beds. LOCATION: In Bethel Village. AVERAGE NIGHTLY PRICE (double occ. ): under $100, $101 - $175, over $175 (rooms, suites, apartments!) AMENITY: A/C, Fireplace (in lobby and restaurant), WiFi, Kitchen, Pet Friendly, Restaurant on premises, Lounge on premises.